(Nanowerk News) A novel fabrication technique developed by a University of Connecticut engineering professor could provide the breakthrough technology scientists have been looking for to vastly improve the efficiency of today's solar energy systems. For years, scientists have studied the potential benefits of a new branch of solar energy technology that relies on nanosized antenna arrays theoretically capable of harvesting more than 70 percent of the sun's electromagnetic radiation and simultaneously converting it into usable electric power. But while nanosized antennas that also serve as rectifiers have shown promise in theory, scientists have lacked the technology required to construct and test them. The fabrication process is immensely challenging. 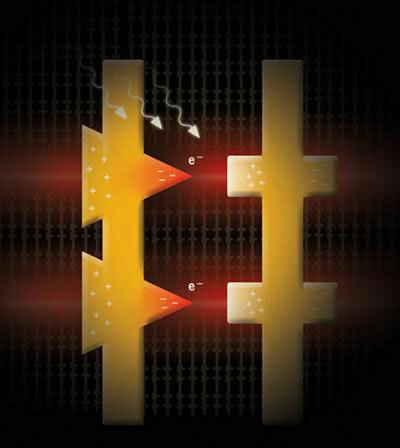 The nano-antennas – known as "rectennas" because of their ability to both absorb and rectify solar energy from alternating current to direct current – must be capable of operating at the speed of visible light and be built in such a way that their core pair of electrodes is a mere 1 or 2 nanometers apart, a distance of approximately one millionth of a millimeter, or 30,000 times smaller than the diameter of human hair. The potential breakthrough lies in a novel fabrication process called selective area atomic layer deposition (ALD) that was developed by Brian Willis, an associate professor of chemical and biomolecular engineering at the University of Connecticut and the former director of UConn's Chemical Engineering Program. It is through atomic layer deposition that scientists believe they can finally fabricate a working rectenna device. In a rectenna device, one of the two interior electrodes must have a sharp tip, similar to the point of a triangle. The secret is getting the tip of that electrode within one or two nanometers of the opposite electrode, something similar to holding the point of a needle to the plane of a wall. Before the advent of ALD, existing lithographic fabrication techniques had been unable to create such a small space within a working electrical diode. Using sophisticated electronic equipment such as electron guns, the closest scientists could get was about 10 times the required separation. Through atomic layer deposition, Willis has shown he is able to precisely coat the tip of the rectenna with layers of individual copper atoms until a gap of about 1.5 nanometers is achieved. The process is self-limiting and stops at 1.5 nanometer separation. The size of the gap is critical because it creates an ultra-fast tunnel junction between the rectenna's two electrodes, allowing a maximum transfer of electricity. The nanosized gap gives energized electrons on the rectenna just enough time to tunnel to the opposite electrode before their electrical current reverses and they try to go back. The triangular tip of the rectenna makes it hard for the electrons to reverse direction, thus capturing the energy and rectifying it to a unidirectional current. Impressively, the rectennas, because of their extremely small and fast tunnel diodes, are capable of converting solar radiation in the infrared region through the extremely fast and short wavelengths of visible light – something that has never been accomplished before. Silicon solar panels, by comparison, have a single band gap which, loosely speaking, allows the panel to convert electromagnetic radiation efficiently at only one small portion of the solar spectrum. The rectenna devices don't rely on a band gap and may be tuned to harvest light over the whole solar spectrum, creating maximum efficiency. Willis and a team of scientists from Penn State Altoona along with SciTech Associates Holdings Inc., a private research and development company based in State College, Pa., recently received a $650,000, three-year grant from the National Science Foundation to fabricate rectennas and search for ways to maximize their performance. "This new technology could get us over the hump and make solar energy cost-competitive with fossil fuels," says Willis. "This is brand new technology, a whole new train of thought." The Penn State Altoona research team – which has been exploring the theoretical side of rectennas for more than a decade – is led by physics professor Darin Zimmerman, with fellow physics professors Gary Weisel and Brock Weiss serving as co-investigators. The collaboration also includes Penn State emeritus physics professors Paul Cutler and Nicholas Miskovsky, who are principal members of Scitech Associates. "The solar power conversion device under development by this collaboration of two universities and an industry subcontractor has the potential to revolutionize green solar power technology by increasing efficiencies, reducing costs, and providing new economic opportunities," Zimmerman says. "Until the advent of selective atomic layer deposition (ALD), it has not been possible to fabricate practical and reproducible rectenna arrays that can harness solar energy from the infrared through the visible," says Zimmerman. "ALD is a vitally important processing step, making the creation of these devices possible. Ultimately, the fabrication, characterization, and modeling of the proposed rectenna arrays will lead to increased understanding of the physical processes underlying these devices, with the promise of greatly increasing the efficiency of solar power conversion technology." The atomic layer deposition process is favored by science and industry because it is simple, easily reproducible, and scalable for mass production. Willis says the chemical process is particularly applicable for precise, homogenous coatings for nanostructures, nanowires, nanotubes, and for use in the next generation of high-performing semi-conductors and transistors. The method being used to fabricate rectennas also can be applied to other areas, including enhancing current photovoltaics (the conversion of photo energy to electrical energy), thermoelectrics, infrared sensing and imaging, and chemical sensors. Over the next year, Willis and his collaborators in Pennsylvania plan to build prototype rectennas and begin testing their efficiency. "To capture the visible light frequencies, the rectenna have to get smaller than anything we've ever made before, so we're really pushing the limits of what we can do," says Willis. "And the tunnel junctions have to operate at the speed of visible light, so we're pushing down to these really high speeds to the point where the question becomes 'Can these devices really function at this level?' Theoretically we know it is possible, but we won't know for sure until we make and test this device."